A Muslim bus driver in Belgium parked his bus during his route last week, to kneel down in the middle of the aisle and start praying. His passengers looked on in wonder, forced to wait for fifteen minutes until their journey could continue. 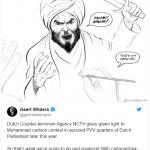 Public transporter De Lijn (‘The Line’) said it will talk to the driver, which is a striking difference to an incident last year when a bus driver was fired after posting a Muhammed cartoon on his personal Facebook page. Last year’s incident was deemed to have been ‘insulting’ to the half of the company’s staff which is of a migrant background, according to Belgian media (which suggests that all migrants are Muslims). Due to ‘tensions’ and with no prospect of reconciliation, the company leadership of De Polder (a subcontractor for De Lijn) decided to let the driver go. Apparently, posting a cartoon in private is cause for dismissal, but hindering passengers with an unnecessary religious display on the job in public only leads to ‘talks’. 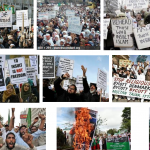 This is just a small example of how we bow to Islam, by refusing to hold Muslims to the standards we apply to ourselves, and by shielding them from jabs and criticisms that non-Muslims would be expected to simply take on the chin. Every day we casually bow to Islam. Most of us don’t even notice it. But I’m certain that most of them do. 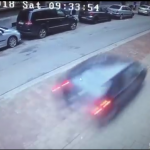 This particular discrepancy was pointed out by right-wing Flemish politician Sam van Rooy (Vlaams Belang / Flemish Interest), who also noticed the media bias in reporting both incidents. 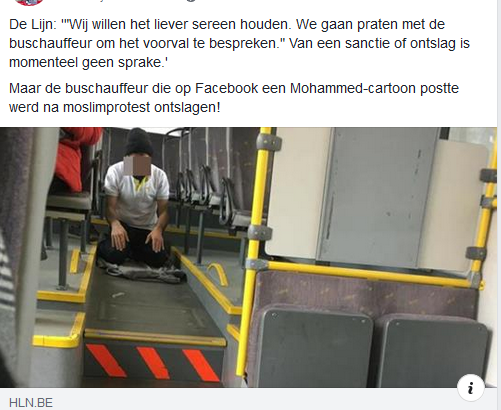 While last year’s incident was described as “Bus driver who caused a fuss with insulting Muhammed cartoon has been fired”, last week’s events turned into “De Lijn looking into complaint about praying bus driver”.